An advanced second trimester tubal pregnancy is rarely encountered because almost all ecopic pregnancy are diagnosed at an early stage. Transvaginal sonography is simple and useful for diagnosing ectopic pregnancy. However, diagnosing the site of ectopic pregnancy and gestational age is sometimes difficult. We experienced a case of an unexpected 13-week tubal pregnancy that was not able to be diagnosed with an accurate pregnancy site and gestational age by transvaginal sonography before surgery. Under massive hemoperitoneum, forceps penetrated the area of pregnancy, which led to further massive bleeding. However, laparoscopic surgery was able to be performed. The findings in our case suggest the importance of examining with transabdominal sonography, especially in an emergency and in advanced tubal pregnancy. In addition, careful manipulation of forceps is required when the ectopic pregnancy mass is large. Recently, most ectopic pregnancies have been diagnosed at an early stage, because of the progress of transvaginal sonography. Consequently, second-trimester tubal pregnancies are rarely encountered. Transvaginal sonography is simple and useful for diagnosing an ectopic pregnancy, but identifying the site of pregnancy is not always possible. Although laparoscopic surgery has recently become mainstream for ectopic pregnancy,, identifying the site of pregnancy and stopping bleeding when intensive abdominal bleeding occurs may be time-consuming. We experienced an unexpected tubal pregnancy at 13 weeks' gestation that was successfully treated with laparoscopic surgery using some techniques under massive hemoperitoneum. The present case was a 39-year-old woman, gravida 0. She had a past medical history of hypertension. She fainted following acute abdominal pain at home and awakened by herself but did not consult a doctor. Two days later, she visited a physician with the chief complaint of fainting episodes and epigastric pain and genital bleeding. Because anemia had progressed to 8.7 g/dl hemoglobin compared with 13.7 g/dl 5 months previously, she was recommended to visit a gynecologist. The next day, she presented to our department. She denied pregnancy, but her serum human chorionic gonadotropin level was 55713 mIU/ml. Transvaginal sonography showed no gestational sac in the uterus and low echoic legion in the Douglas pouch suspected of intraabdominal hemorrhage. An approximately 2-cm mass was found on the left side of the fundus of the uterus, and the tumor might have had subserosal fibroids, but there was no other site of ectopic pregnancy. Accordingly, we considered pregnancy in the left interstitial Fallopian tube More Details or isthmus of the left fallopian tube. Emergency laparoscopic surgery was performed with the diagnosis of rupture of ectopic pregnancy. The right tube, but not the left side, was remarkably swollen and raised toward the head, but this was not able to be identified by transvaginal sonography [Figure 1]. A large amount of hemorrhage was found in the peritoneal cavity, and adhesion suspected of being Fitz–Hugh–Curtis syndrome was observed on the liver surface. During the operation, grasping forceps penetrated the area of pregnancy, which resulted in intensive bleeding. Bleeding was uncontrolled. Therefore, the assistant gripped the suspensory ligament of the right ovary to reduce the amount of bleeding. We rapidly confirmed the right ovary while tracing the suspensory ligament and identified the mesosalpinx. Right salpingectomy was performed with bipolar forceps and an ultrasonic energy device, and the right tube was collected in a specimen pouch. The specimen was extracted from the abdominal cavity via a 12-mm port in the umbilicus. 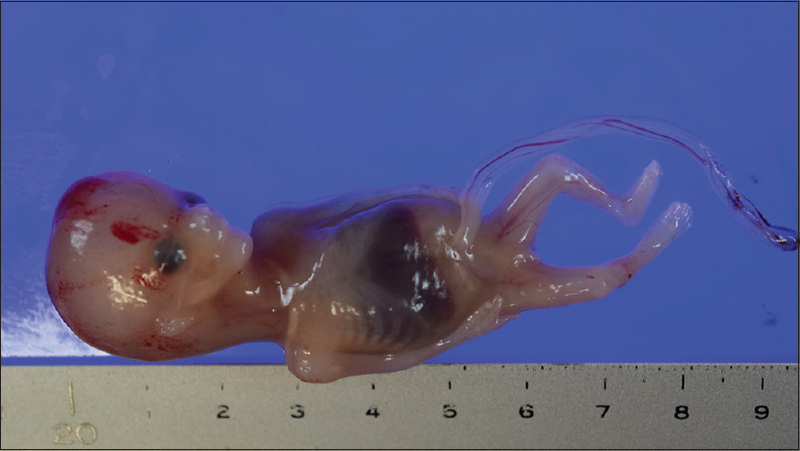 Contrary to expectations, we found placental tissue and a fetus measuring approximately 2.5 cm in biparietal diameter, and this was nearly equivalent to 13 weeks' gestation [Figure 2]. Ectopic pregnancy occurs in approximately 1%–2% of all pregnancies. Second trimester tubal pregnancies are rarely encountered. We were not able to accurately diagnose the site of pregnancy by transvaginal sonography, despite the existence of a fetus equivalent to 13 weeks' gestation in the right tube. Few studies have investigated the reason why such rare cases were maintained until the second trimester and not ruptured. Some reports have described that tubal rupture might be delayed by adhesions around the fallopian tube, such as chlamydia infection., Although we found film adhesion associated with chlamydia infection on the affected side in this case, it was unlikely to have delayed tubal rupture because the degree of adhesion was mild. However, the tubal wall was 3.4-mm thick because of chronic inflammation by chlamydia infection. Because pregnancy was established in the thickened fallopian tube, rupture of the fallopian tube might not have occurred in the first trimester. Identifying an ectopic pregnancy site is not always easy. We diagnosed subserosal fibroids as an ectopic pregnancy site in our case. In laparoscopic surgery, we observed that the right tube, which was the site of pregnancy, was raised toward the head. Because there was massive hemoperitoneum, the right tube was deviated to a position that was difficult to identify by transvaginal sonography, and this led to misrecognition. The site of pregnancy might have been recognized if abdominal sonography had been performed. In our case, on the basis of episodes of fainting, progression of anemia, and the findings of transvaginal sonography, we decided that surgery should precede a magnetic resonance imaging (MRI) examination. Diagnosis by ultrasound examination or MRI can be used for an advanced ectopic pregnancy. However, Liu et al. reported that MRI should be avoided in case of emergency. Culdocentesis and computed tomographic examinations have also been used for diagnosing ectopic pregnancy. However, both of these methods are used to confirm whether there is hemoperitoneum. The pregnancy site may be identified by computed tomography, but this is rare unless the mass is large. In our case, the size of the affected tube was large, and identifying the mesosalpinx was difficult. In addition, because the fallopian tube was considerably enlarged and fragile, it was perforated only by touching it with grasping forceps. Strong bleeding from the site of pregnancy occurred. Prophylactic mesosalpingeal vasopressin injection is effective for decreasing the amount of bleeding. However, we did not use vasopressin because of the difficulty in identifying the puncture site and the need to quickly remove the fallopian tube owing to increased bleeding. Therefore, we needed to promptly identify the resection line. The assistant grasped the suspensory ligament of the right ovary to reduce blood flow to the right adnexa. We then confirmed the right ovary while tracing the suspensory ligament of the ovary and identified the mesosalpinx. In previous reports of tubal pregnancy after 12 weeks of pregnancy, almost all cases had adnexectomy performed., In our case, we preserved the affected ovary by prompt identification of the line to be resected under hemoperitoneum. 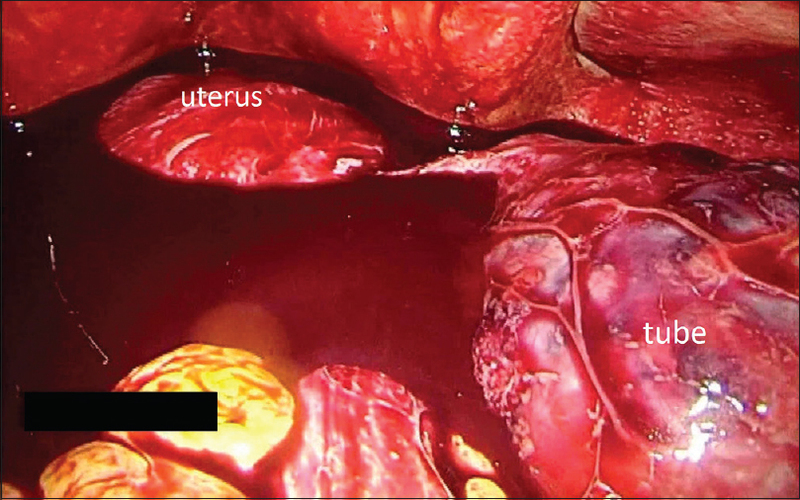 We report a case of unexpected ectopic tubal pregnancy at 13 weeks' gestation that was treated with laparoscopic surgery under massive hemoperitoneum. Diagnosis of the site of ectopic pregnancy is often difficult. Detailed examination by sonography is considered important, not only by transvaginal but also by transabdominal sonography, while imaging examinations are limited in an emergency. When the mass of ectopic pregnancy is large, protective manipulation by forceps and rapid identification of the excised site are important in laparoscopic surgery. The authors certify that they have obtained all appropriate patient consent forms. In the form, the patient has provided consent for her images and other clinical information to be reported in the journal. The patient understands that her name and initials will not be published and due efforts will be made to consent her identity, but anonymity cannot be guaranteed. Cunningham FG. Ectopic Pregnancy. Williams Obstetrics. Vol. 24e. New York: McGraw-Hill; 2014. p. 377-95. Bouyer J, Coste J, Fernandez H, Pouly JL, Job-Spira N. Sites of ectopic pregnancy: A 10 year population-based study of 1800 cases. Hum Reprod 2002;17:3224-30. Liu J, Khan A, Johnson S, Grigorian C, Li T. The usefulness of gestational sac and placental sonographic morphology in differentiating between second-trimester tubal and abdominal pregnancy: Case report and a review of literature. J Clin Ultrasound 2014;42:162-8. Kanno H, Takahiro S, Yasaka M, Sagara Y, Nishijima Y, Izumi S, et al. A patient with ruptured ampullary tubal pregnancy with a viable fetus in week 11 of gestation who underwent laparoscopic surgery. Japn J Gynecol Obstet Endoscpy 2016;32:290-5. Cohen A, Almog B, Satel A, Lessing JB, Tsafrir Z, Levin I, et al. Laparoscopy versus laparotomy in the management of ectopic pregnancy with massive hemoperitoneum. Int J Gynaecol Obstet 2013;123:139-41. Carson SA, Buster JE. Ectopic pregnancy. N Engl J Med 1993;329:1174-81. Shingaki K, Miyazaki N, Kawabe K, Takada S. A case of tubal pregnancy presenting with acute abdomen at 14 weeks gestation. Adv Obstet Gynecol 2015;67:67-73. Worley KC, Hnat MD, Cunningham FG. Advanced extrauterine pregnancy: Diagnostic and therapeutic challenges. Am J Obstet Gynecol 2008;198:297.e1-7. Menofy M, Badran KE, Ramadan MF, Abd-Elkarim S, Shazly M, Ali MK, et al. An advanced second trimester tubal pregnancy: Case report. Middle East Fertil Soc J 2012;17:136-8.